CERTIFIED ORGANIC! 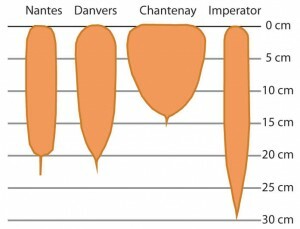 Jeanette carrot is an extra early Nantes type that colours up quickly for early summer salads. Long, smooth, conical roots grow to 20cm with strong tops for easy pulling and tidy bunching. Jeanette Organic carrot seeds produce a root with great flavour and texture in this superb hybrid variety. Harvest as delicious baby carrots, or allow them to grow to the mature size of 20-23cm (8-9") long. Be sure to thin seedlings when they are a couple of centimeters tall to allow 4-10cm (4.5-4") between each carrot in the row. This will allow them to develop fully without tangling up underground. Whatever type of carrot seeds you plant it’s easy to learn how to grow carrots from seed. Here are some common characteristics. Carrots are biennials, so they use their leaves in the first year, to gather energy from the sun to build a big, starchy root. This is where they store their energy over the winter. The following spring they use that stored energy to send up a tall umbel of white flowers, looking strikingly similar to Queen Anne’s Lace to which they are closely related. When the weather gets cold in the first year of growth, carrots convert a lot of their starches to sugars, so the roots become sweeter in winter. All carrots can be harvested immature as baby roots, which tend to be crunchy but tender, and quite sweet. They can also be left to reach their full size, shape, and colour, of course. All carrots are high in beta-carotene, a pigment that we metabolize as vitamin A when we eat it. A lack of vitamin A can result in poor vision, hence the notion that carrots are good for your eyesight. Carrots are also rich in Vitamins C, B6, and Niacin. 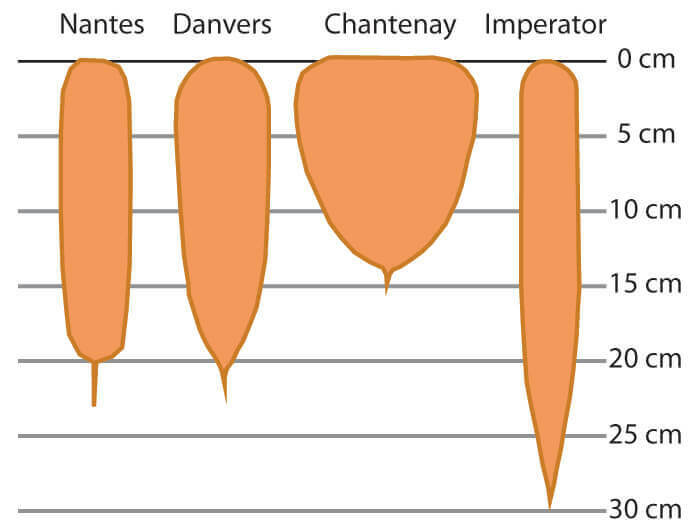 Because of the relatively vertical nature of the plant’s form, carrots can be grown fairly densely, and are therefore useful within the economy of space in a smaller growing area. That is, even a little garden can produce a lot more in carrots than by, say, lettuce of cucumbers. The seeds can be sown from early spring right through late August for a harvest that will last nearly year round, so they form an essential part of nearly every vegetable garden. The trick with carrot seeds is to sow them shallowly and then maintain moisture in that top layer of soil until they germinate. Because they may take as long as three weeks to germinate, this can be challenging, especially in hot weather when the surface of the soil is nearly always dry. The way to achieve this is to water very deeply prior to planting, and then either water very regularly or employ some other means to reduce evaporation. Some growers like to use lightweight row cover, which helps to maintain moisture and has the added benefit of keeping away the dreaded carrot rust fly. But we’ve also seen some growers simply lay a 2×4 beam, or even plywood, over the damp seedbed. This is lifted every few days to check on progress, and then removed at germination. If you have the luxury of growing carrots without the presence of carrot rust flies, you may still be concerned with soil dwelling insects such as wireworms, which seem to be true lovers of carrots. They are so attracted to carrots, in fact, that a full-grown carrot makes a very good lure for wireworms. Just bury carrots or pieces thereof in several areas around the intended seedbed, and mark where you bury them. If wireworms are present, you can then dig up the carrot pieces and easily remove the wireworms from the bed, or at least go a long way to reducing their population. Take extra care with your carrot bed to insure that the soil is loose and completely free of stones or other debris. Truly beautiful carrots are easy to grow if you take the extra time to produce a good home for them. Avoid nitrogen-heavy fertilizers and manure that has not been composted for more than a year, as you may end up with big, bushy tops on pitiful, spindly roots. We Recommend: Bolero (CR283). It’s not fair to recommend one carrot over another because they are all so different and appealing in their own ways. But for simple ease of planting Bolero carrot seeds can’t be beat. Direct sow April to mid-July for harvests from July to November. Direct sow winter-harvest carrots in the first two weeks of August. Sow at 3 week intervals for a continuous harvest. Optimal soil temperature: 7-30°C (45-85°F). Seeds take as long as 14-21 days to germinate. Because carrot seeds are tiny, they need to be sown shallowly. The trick is to keep the top-most layer of soil damp during the long germination period. Water deeply prior to planting. Direct sow the tiny seeds 5mm (¼”) deep, 4 seeds per 2cm (1″), and firm soil lightly after seeding. Make sure the seeds are only just buried. Water the area with the gentlest stream you can provide, and keep it constantly moist until the seeds sprout. Ideal pH: 6.0-6.8. The softer and more humus-based the soil, the better. When soil is dry enough in spring, work it to a fine texture. Broadcast and dig in ½ cup complete organic fertilizer for every 3m (10′) of row. Avoid fresh manure. Carrots will become misshapen, but still edible if they hit anything hard as they grow down into the soil. Keep weeded and watered. It is very important to thin carrots in order to allow them room to grow, and so they don’t compete for available nutrients, moisture, and light. Then to 4-10cm (1½-4″) when the young plants are 2cm (1″) tall. Use wider spacing to get larger roots. As they grow, carrots push up, out of the soil, so hill soil up to prevent getting a green shoulder. Here are some more good tips on how to grow carrots from seed. Carrots can be harvested at any size, but flavour is best when the carrot has turned bright orange. After harvest, store at cold temperatures just above 0ºC. You can store in sand or sawdust, or simply leave carrots under heaped soil in the garden during the winter, and pull as you need them. In optimal conditions at least 60% of seeds will germinate. Usual seed life: 3 years. Per 100′ row: 2.4M seeds, per acre: 1,044M seeds. Rates are for raw, not pelleted seeds. The Carrot Rust Fly – This pest lays its eggs at the base of the growing carrots. The larva of the fly chews tunnels and unsightly grooves through the surface of the root, causing rot. Unfortunately the damage isn’t just cosmetic; the activities of the Carrot Rust Fly larva changes the flavour of the carrot and makes it quite inedible. Use our floating row cover to keep the adults away from the carrots. Plant after the beginning of June to avoid the first and worst infestation period. The good news for apartment dwellers who want to grow carrots on their balconies is the Carrot Rust Fly is not a good flyer. It is unlikely to infest their high-rise crop. Wireworm – These are the larva of click beetles. They are about an inch and a half long, slender and reddish brown. When squeezed they turn as rigid as a wire, hence the name. Wireworms chew irregular holes through roots, making the carrots inedible. Wireworms prefer a moist soil so preparing your carrot bed so that it is well drained will help. Interplanting with mustard leaf is an excellent way to discourage wireworm damage. The flavour of the mustard is one deterrent, and mustard also helps to dry out the soil, forcing the wireworm away from the roots. Predatory nematodes are an effective control for both Carrot Rust Fly and wireworm. Apply generously in the spring when the larva of both pests is most active. Plant with bean seeds, Brassicas, chives, leeks, lettuce, onions, peas, peppers, pole beans, radish, rosemary, sage, and tomatoes. Avoid planting with dill, parsnips, and potatoes. Carrots planted near tomatoes may have stunted roots, but will have exceptional flavour. Chives also benefit carrots.